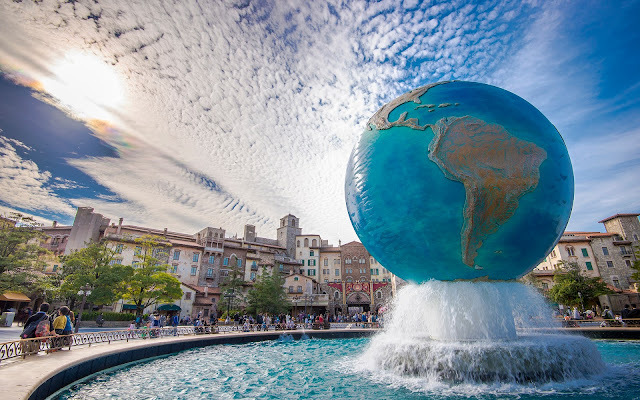 Tokyo Disney Sea is themed to various ports of call found all around the world, so it's only fitting that the first monument guests see when entering the park is a massive globe perched atop a roaring fountain, slowly rotating. The park takes guests to waterfronts ranging from Italy to the Americas to the Middle East, and even to imaginary ports of call straight out of fantasy and imagination. But throughout it all is the spirit of exploration and the intrepid sense of venturing throughout the globe. What a beautiful sight to behold, then, for those entering and leaving this "Sea of Dreams!" The Aquasphere turns on a beautiful fall day.